The Greek capital’s winter swimmers don’t have to plunge in icy lakes and rivers. “It’s August 168,” is a typical joke among Greeks who never put away their beach towel, swimsuit, sarong or sunscreen in the summer drawer. The Greek capital’s winter swimmers are far different to their European counterparts. They don’t have to plunge in icy lakes and rivers, nor do they need to buy fancy neoprene suits; in short, they don’t need to muster every ounce of courage to dive in. All they need to do is travel the half-hour it takes to get from central Athens to the nearest sun lounger to bask under the (usually warm) Attica sun and feel the waves lap at their feet. They’re aged anywhere between 18 and 80 and usually brag about their robust constitution (thanks to winter swimming, of course). They can be spotted – sporting a wicked tan even in the middle of winter and smelling of coconut oil – as soon as the tram from central Syntagma Square turns onto Poseidonos Avenue on the southern coast. 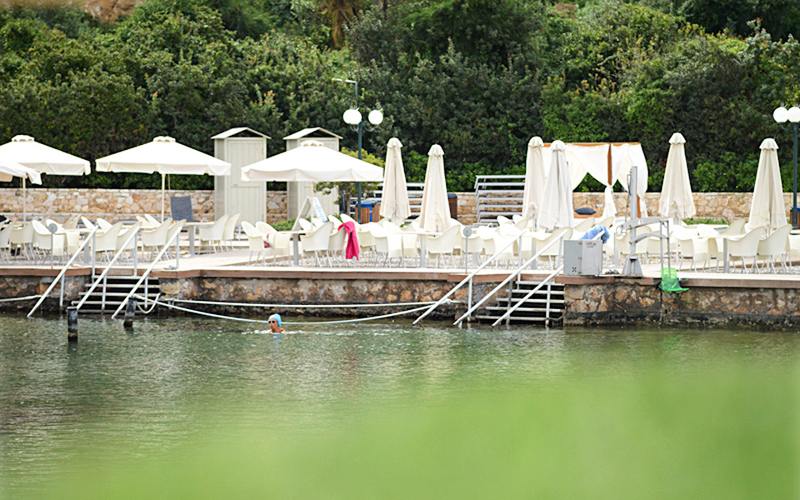 The water of lake Vouliagmeni promises the natural experience of a thermal spa. The beach: Loungers, chairs and umbrellas located on a natural stone deck paved with wood, right beside the lake nestled below an imposing cliff. Parts of the beach have pebbles. The water: Brackish, it is constantly being refreshed by the sea and underground natural springs, and promises the natural experience of a thermal spa. The lowest temperature recorded at this natural lake in the winter is 22°C. Winter denizens: This is a popular destination in the summer with the city’s elderly community because of its healing springs. In winter, it draws a younger crowd, a few tourists and families on the weekends. Services: Loungers, umbrellas equipped with heating units, hot showers, changing rooms, lifeguard and first aid services, free parking and wheelchair access. Extras: There’s a café serving snacks and warm beverages. Admission: Winter discount on Tuesdays & Thursdays (7€); 9€ during summer and other weekdays; 10€ on Saturdays & Sundays; free entrance for children aged up to 5 years. Access: With the Syntagma-Voula tram (Glyfada or Voula stop) and then by bus to the lake (numbers 114, 115, 149). With the metro to Elliniko station and from there on bus number 122. Contact: Tel. (+30) 210.896.2237, (+30) 210.896.2239, www.limnivouliagmenis.gr. 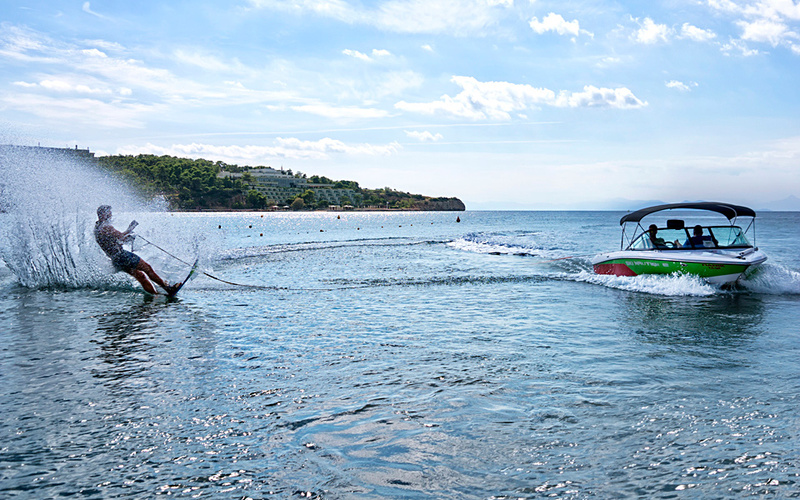 Astir beach offers water skiing school and two beach volleyball courts for the sporty types. The beach: A 300-meter sandy stretch that’s protected from the wind, with elegant cushioned loungers. The water: Shallow with a sandy bottom and temperatures in the winter range from 13 to 22°C. Winter denizens: Teens and 20 somethings playing beach tennis or catching some rays, families with young children on the weekends, pensioners, amateur athletes and quite a few tourists and business travelers on weekdays. Services: Lifeguard and first aid services, sun loungers, changing rooms, hot showers, free Wi-Fi and parking. Extras: Towel rental for 5€, water skiing school and two beach volleyball courts for the sporty types and a snack bar serving natural fruit juices, coffees and sandwiches. Admission: 6€ on weekdays; 8€ on weekends; free entrance for kids up to 12. Access: With the Syntagma-Voula tram (Glyfada or Voula stops) and then by bus to the beach (number 114). By taxi from the tram’s Voula terminus (5€) or by bus on the E22 line from Akadimias Street in central Athens, getting off 500 meters from the beach entrance at the Lemos turning. Contact: 40 Apollonos, Vouliagmeni, tel (+30) 210.890.1619, www.astir-beach.com. Akti iliou is quiet and, in winter, bathers bring their own beach chairs. The beach: A 350-meter stretch of sand and pebbles, considered ideal for sunbathing and beach jogging. 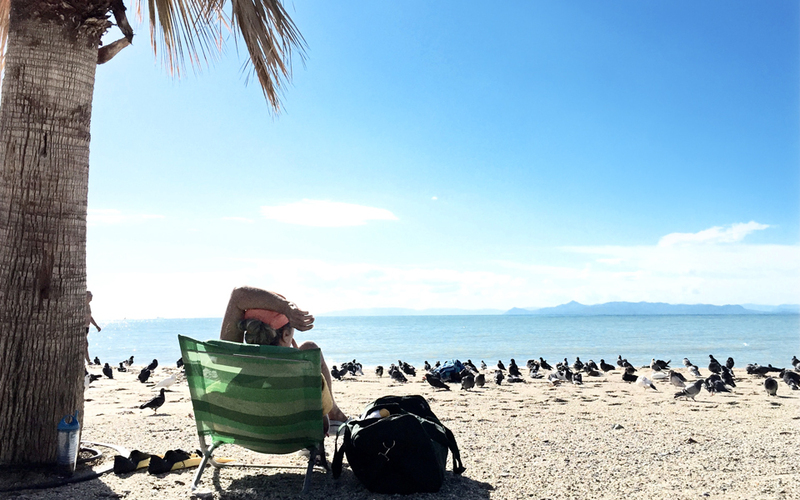 It is quiet and, in winter, bathers bring their own beach chairs. The water: The average temperature in January is 20-22°C and can drop to 14°C in March. Winter denizens: Winter swimmers from the 200-member Alimos association, couples taking a stroll after work and dog lovers. Services: The local association of winter swimmers will let you use their shower and changing facilities if you ask. The beach also has an area reserved for beach tennis; even if you’re alone, you’re sure to find a partner to play. Extras: A free open-air gym at the Kalamaki tram stop. Access: The beach is located between the Kalamaki and Zefyros stops of the Syntagma-Voula tram, about a 5 or-6-minute walk from each. Stolidi boasts a long, sandy enclosed beach in Alimos, perfect for sunbathing. The beach: “Stolidi” in Greek means ornament or jewel, and this long, sandy enclosed beach in Alimos, perfect for sunbathing, fits the description. Winter denizens: The left side of the beach “belongs” to beach tennis fans and the right side to winter swimmers. The sun lizards are usually seen on the metal loungers in the middle. Services: Free showers and changing rooms, and free loungers from the small fast food restaurant if you purchase a coffee or snack. Extras: The small restaurant serves very decent food (French fries are fresh not frozen) and prepares Greek dishes like grilled sardines, fish with spinach and haddock with garlic sauce (prices 8-11€). Access: Kalamaki stop on the Syntagma-Voula tram. 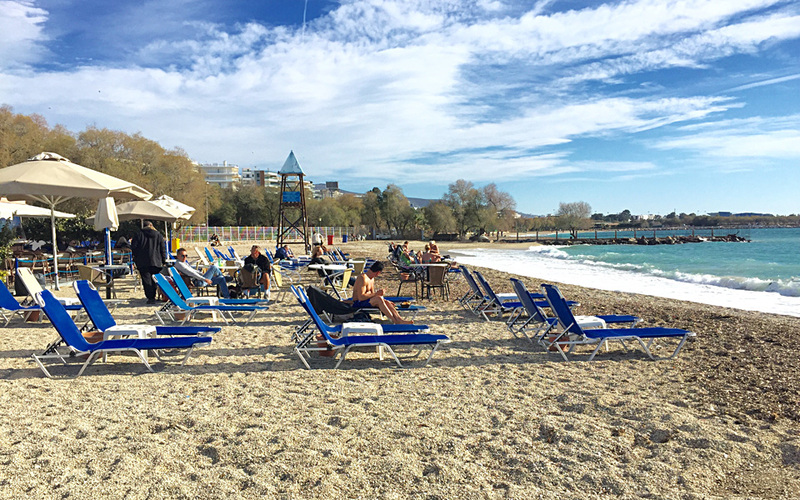 Pensioners and middle-aged winter swimmers, young sporty types and dog lovers frequent the Glyfada beach. 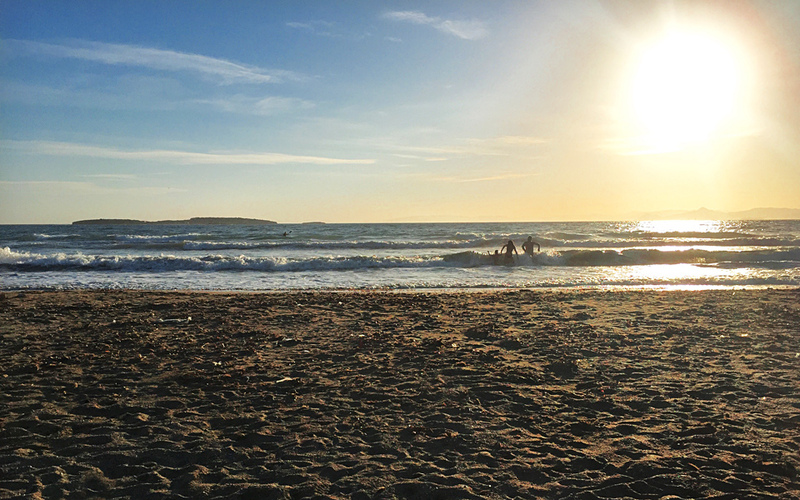 The beach: This is one of the most popular beaches all year round with residents of the southern suburb of Glyfada. Water: The average temperature in January is 20-22°C and can drop to 14°C in March. Winter denizens: Greek and foreign pensioners and middle-aged winter swimmers, young sporty types and dog lovers. Services: The beach does not offer any particular services, though there are a few wooden benches and umbrellas where you can put down your towel. It’s just a15-minute walk from the center of Glyfada and near the Delfinia restaurant, known for its fresh fish and homemade desserts. 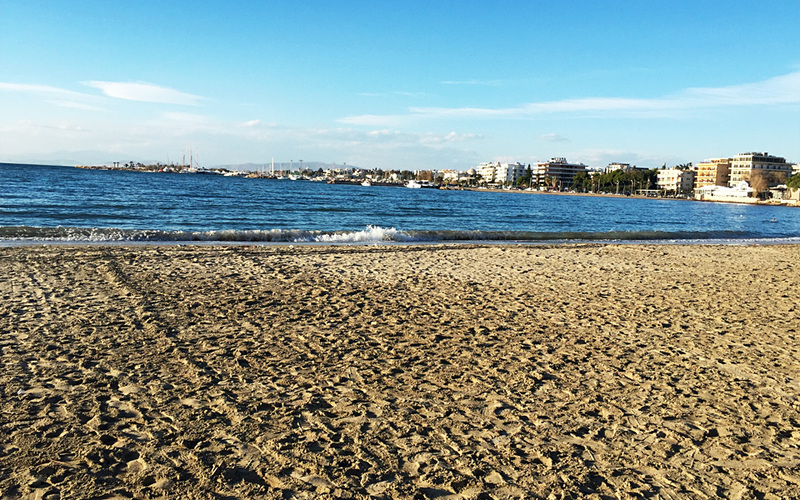 Extras: Combine a swim with a walk along the Glyfada Marina. Admission & Hours: Access: Glyfada Beach stop on the Syntagma-Voula tram. 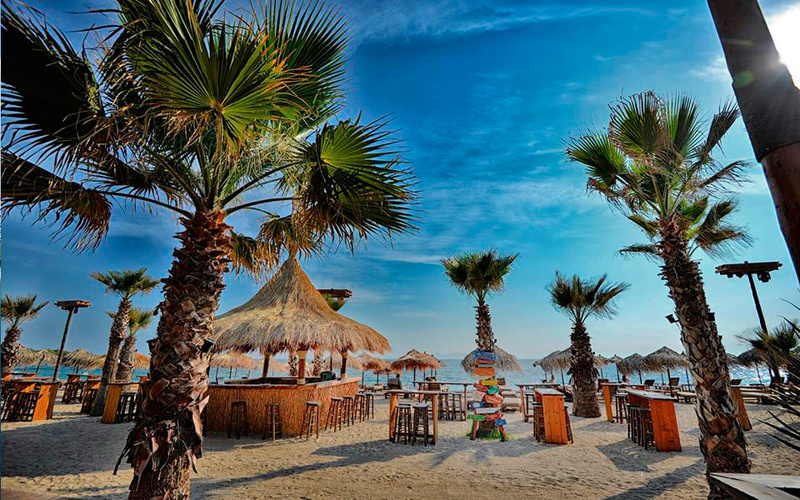 Asteras beach Glyfada does not offer any services or amenities in the winter. The beach: A child-friendly sandy expanse that is kept beautifully combed and cleaned, even after a winter shower, by the café-bar-restaurant located in front of it. Winter denizens: A few winter swimmers and lots of families on the weekends, joggers and folks who just want to enjoy a seaside coffee in the sun. 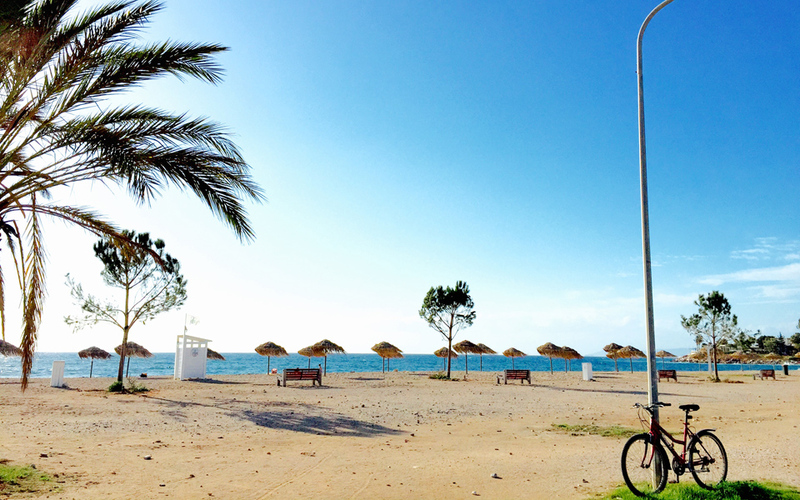 Services: The beach does not offer any services or amenities in the winter. Extras: The Balux café-bar-restaurant serves special meals for 9.99€ from Monday to Friday, 12:00-18:00. Access: 58 Poseidonos Avenue, Glyfada; Asteria stop on the Syntagma-Voula tram. The S beach attracts those looking for some peace and quiet, winter swimmers, families with kids, joggers, and fans of Tai chi and Yoga. The beach: The facilities of the South Coast complex are closed during winter, but people still come for the beach itself, even on overcast days. Winter denizens: Those looking for some peace and quiet, winter swimmers, families with kids, joggers, and fans of Tai chi and Yoga. Services: There are no services and amenities in the winter. Extras: There are plenty of kiosks to get water or a soft drink just outside the complex. Admission & Hours: Access: Last stop of the Syntagma-Voula tram.